Announcement Welcome to The Opal Dealer's Etsy page! We are the #1 supplier of Crushed Opal for Inlay, Ring Making, Jewelry Making, Woodworking, and whatever else you can think of. Enjoy our countless options of crushed opal and ring blanks, and expect the best quality we can offer. Welcome to The Opal Dealer's Etsy page! We are the #1 supplier of Crushed Opal for Inlay, Ring Making, Jewelry Making, Woodworking, and whatever else you can think of. Enjoy our countless options of crushed opal and ring blanks, and expect the best quality we can offer. Ordered the red crushed opal and was very pleased. It's not too pink or orange, and has the sine I was looking for. Beautiful and shipped quickly. Great seller. The Opal Dealer specializes in Synthetic Lab-Created Opal. 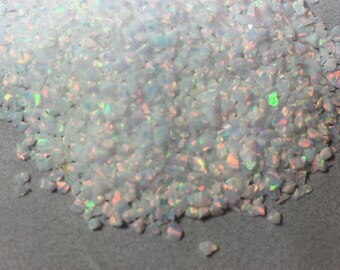 We sell primarily Crushed Opal for Inlay and Ring Making Supplies. We are the #1 supplier of Crushed Opal in Northern America and have thousands of happy customers. Our goal is to supply the highest quality products, top notch customer service, and get your products to you quickly. If you have a moment check out our glowing reviews from some of our amazing satisfied customers! If you ever have a problem with your order, we will make it right. Please contact us and let's talk! I am the owner of The Opal Dealer. In my free time I enjoy making rings and jewelry, watching movies, but most of my time is spent learning about new things that catch my interest. I believe hard works brings not only success, but fulfillment. How much is 1 Gram? 1 Gram of Crushed Opal is equivalent to approximately 1/4 teaspoon. How many rings can I make with 1 Gram of Crushed Opal? With a standard 8mm Wide, 4mm Channel Ring Core you can expect 2+ rings per gram. Use a piece of paper under the ring when adding the inlay to catch any falling pieces and reuse! No, we sell synthetic lab-created Crushed Opal. Natural opal does not look as good crushed into small pieces. We are happy to make discounts on large purchases. If you are interested in wholesale pricing feel free to send us a message. Should I choose Medium Size or Fine Size Crushed Opal? Medium size is approximately 0.5mm - 2mm piece stones. When inlaying you will see more of the base color. Fine size is approximately 0.5mm stones. When inlaying you will not see as much of the base color, but the play-of-color will be more intense. If you are interested in a sample of a specific color, let us know in the comments when you order and we are happy to give you a small sample for free. If you request multiple colors, we will ask for payment. How accurately do your pictures capture the color of the Crushed Opal? We spend a good amount of time photographing and editing our products to get as close as possible to the natural color of opal. Our Crushed Opal may look slightly different in person.